The Kontokali Bay Resort & Spa is a Hotel-Bungalow complex on the central eastern shoreline of the emerald Isle of Corfu, situated only 6-km from the island¿s capital, Corfu Town. 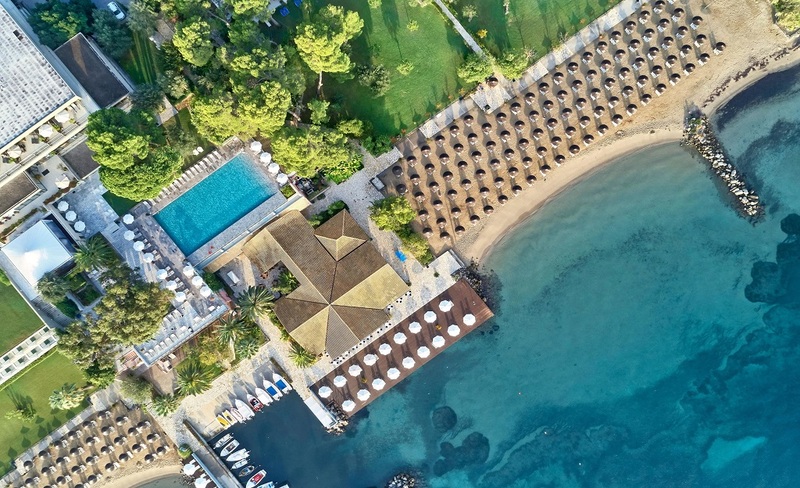 Built on a densely wooded peninsula and on a natural incline, The Main Building of the Kontokali Bay overlooks both the sparkling blue waters of the Ionian Sea that separates Corfu from the taupe, coastal mountains of the Greek Mainland and the Gouvia Marina. The Bungalows are set in the midst of pine and cypress-laden garden, full of vibrant red and mauve bougainvilleas that add the artist¿s final brushstroke to this perfect Canvas. The well equipped spa centre offers an indoor heated pool, hammam, hot tub, 2 saunas a steam room, and gym (free). Massages, aromatherapy and anti-ageing treatments are also available (with extra charge). A kids' pool is also available. Dining and breakfast options at Kontokali Bay include a buffet style restaurant and an A la carte restaurant (supplement). A beach-side a la carte restaurant and a beach tavern (buffet style) are available for lunch. The hotel also has a lobby/piano bar and a beach bar. Staff can arrange various activities such as water skiing, paragliding, horseback riding (at 10km) and mountain biking. Free parking is available at the hotel.